OK, so here ya go! Just be warned - they're kinda gross....and not as clear as I'd have liked. It's very hard to get decent pictures of a horse, especially when the horse wants to jig and jog and wiggle. Drugs, however, are our friends, and helped a little. They're just a bit dark - when I enlarge them on my PC, I can see the details...not gonna promise anything, though! These pictures were taken Saturday afternoon, about 18 hours after discovery. 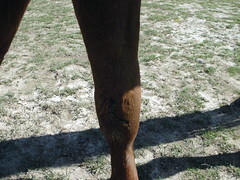 This is the least damaged leg - the knee is scraped, not deeply, and there hasn't been a lot of blood. The worst one. 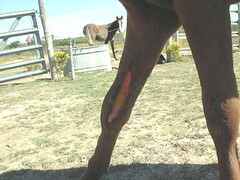 Healing is already occurring here - the "yellow" area in the bottom of the cut is all new. Soma Spray works miracles - this is only 18 hours after I treated it the first time! The grossest part of this is the skin flap at the bottom. I can't bring myself to slice it off...but it needs to come off. I am going to try to talk my mostly useless neighbor into doing it for me. She got 6ccs of Penicillin Friday - Monday, and 2 grams of Bute 2X/day. Today, I skipped the AM dose of Bute, but will give her 2 grams tonight, to help with any pain she might feel tonight. I will not be unwrapping the leg tonight; I did a through cleaning and medicating last night and want to give it a chance to heal more before ripping off the bandages (they tend to stick). In one of the pictures, you can see Finn in the background - the picture dosen't show all his grey hairs. He is either going to be a nice Red Roan, or he's going to go all grey. Right now, I'm betting on the grey - he has a half-dollar size spot on his rump and a patch on his neck about the size of a dollar bill that is solid grey. Only time will tell! I think she'll be okay. 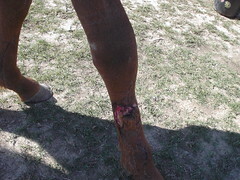 She'll have scarring, but she's young and young heals better. She may not be as physically perfect as before, but she won't look like a frankenhorse either. We used to give the horses garlic when they had banged themselves up, either a head of it at supper time, or a tablespoon or so sprinkled on their grain, some vitamin suppliments, and a mineral block (if they weren't turned out to get to the ones in the field) it seemed to help them heal faster and with less runny gook. I'm so glad she's doing well and going to be fine. the wiggly jig is a great indication. As for Finn, time will tell, but if you hadn't said what color he is, I would have thought him a dark grey.